If you have a question that isn’t answered here, send it to us. Why does Akron Children’s need a new building? Akron Children’s has become the largest pediatric healthcare provider in northeast Ohio, caring for more than 650,000 patient visits a year. As a result of our significant growth in patient volumes and services, we’ve outgrown our current facilities. A new critical care tower is needed to meet current and future healthcare needs and to accommodate the changing face of healthcare delivery. 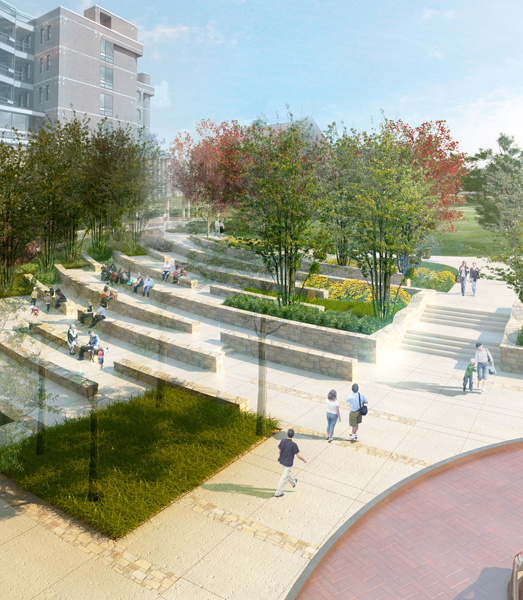 What all is included in the $200 million campus expansion? The Kay Jewelers Pavilion will house the Women’s Board of Akron Children’s Hospital Neonatal Intensive Care Unit, emergency department and the GoJo® Outpatient Surgery Center. It will be the center of our downtown campus and the focal and entry point of Akron Children’s Hospital. The expansion will also include a new 1,254-space parking deck with an enclosed concourse that takes patients and staff from the garage to the new building and beyond into the existing hospital. A new, larger Ronald McDonald House will also be built to accommodate our growing patient volume. Who has been involved in the planning process? The hospital is using a process called Integrated Lean Project Delivery®. This approach brings together national and local architects, contractors and project management teams to work with the hospital’s leadership and departmental teams, which include department leaders, physicians, nurses, staff, support service representatives and patient families, to refine how the individual departments deliver patient care. The process is expected to improve standardized activities, eliminate waste and enhance the overall patient experience. What all is involved in the Integrated Lean Project Delivery process? Department teams, in conjunction with architects and builders, began by using small scale models, such as paper dolls, to design their floors. Blueprints were then tested in full-scale mock-ups constructed in a local warehouse. The various teams went through mock patient scenarios to test the design before the real construction begins. What are some of the community and economic benefits of the Kay Jewelers Pavilion? The building is being designed to support changes in the way the hospital delivers patient care in these areas. This will result in the hospital being able to serve more patients, as well as garner better patient satisfaction. Local participation has also been a major consideration in selecting firms to work on the design and construction of the new building, thereby supporting the local and regional economy. The expansion will also enhance the economy as Akron Children’s becomes an even more prominent employer and collaborator with local universities and businesses, as well as a magnet for healthcare professionals. Once the Kay Jewelers Pavilion opens in 2015, Akron Children’s will add an estimated 175 new employees. A recent study indicated our local economic impact to be more than $1 billion annually. When will construction begin on the Kay Jewelers Pavilion? We broke ground on the new parking deck in June 2012. We also began conducting kaizens in 2012 for each service area in the Kay Jewelers Pavilion. The kaizens were 2- to 5-day workshops aimed at designing the most efficient and flexible space. We will begin construction on the Kay Jewelers Pavilion in the spring of 2013. Will there be traffic disruptions during this time? If so, what’s the best way to get the latest information about them? Yes, there will be traffic disruptions. For the most current information about traffic disruptions, go to our website. How big will the Kay Jewelers Pavilion be? It will be 7 stories tall and occupy 368,735 square feet. That’s about 20,000-square-feet larger than the existing hospital and about 148% larger than the Considine Professional Building. The Kay Jewelers Pavilion will be located at 177 W. Exchange Street in Akron. What will the Kay Jewelers Pavilion be like? The 100-bed NICU will feature private rooms, which encourage bonding between patients and their babies. The 32,000-square-foot, GoJo® Outpatient Surgery Center will accommodate procedures performed on a same-day basis, which now encompass 80% of our surgical volume. The outpatient surgery center will include 6 ORs, a post-anesthesia care unit, and pre- and post-surgery waiting areas. 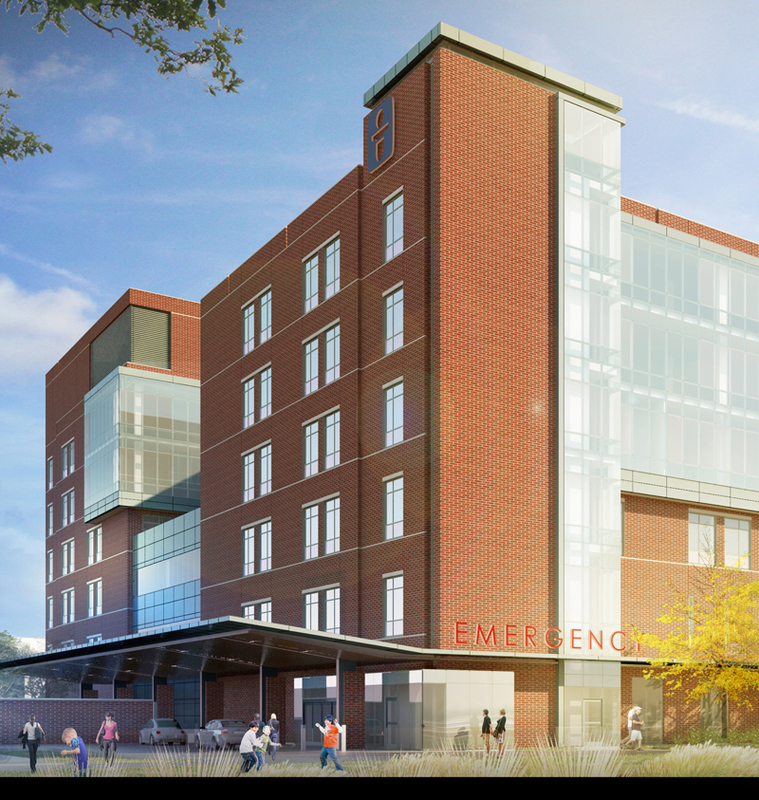 The new emergency department has been designed to meet increased patient volumes and trauma requirements and will feature advanced diagnostic equipment. The space will include 3 trauma bays and an emergency behavioral health unit. The space has been created with input from patient families and frontline staff to ensure the best patient and family-centered experience. Public spaces have been designed to reassure our young patients and their families through an uplifting environment and artistic distraction walls. The Kay Kafe will provide nourishment and relaxation for our patients, families and staff. The FedEx® Outdoor Amphitheater will also contribute to the positive energy that characterizes Akron Children’s. How much will the Kay Jewelers Pavilion cost? That will be decided as an outcome of the Kaizen Workshops and the streamlining of patient care. The hospital plans to invest up to $200 million in the new building and parking garage. Two-thirds of our expansion costs will be covered through public financing and internal resources. The remaining $60 million will be raised through philanthropy – the generosity of individuals, foundations, corporations and sponsorships: $50 million will cover all parts of the expansion, with the remaining $10 million to enlarge and renovate the Ronald McDonald House. How will my gift to the Building on the Promise campaign benefit the children? Philanthropy has helped make Akron Children’s the nationally-ranked healthcare facility it is today. Through your support of the Building on the Promise capital campaign, you can continue to play a vital role in ensuring that the highest level of care is available for every child, teen and family for generations to come, regardless of their ability to pay. Donate now or learn about our high-profile recognition opportunities for individuals, organizations and foundations. Do you have a question that isn’t answered here? If so, send your question to us.